KTM is a well known motorcycle brand known for its sporty off-road and endurance bikes world over. KTM, an Austrian company, is quite popular with its Duke series of bikes in Europe and USA and it has recently introduced KTM Duke 200 in India in a joint with Bajaj Auto. Bajaj and KTM have been working together on the Duke 200 and Bajaj’s upcoming Bajaj Pulsar 200 NS as well with the design team of KTM working in close collaboration of Bajaj Pulsar team. Also at the time of KTM launch in India, Bajaj converted its pro-biking outlets into KTM stores. There are strong reasons and cooperation behind such good collaboration which involves Bajaj’s investment and long terms growth plans with KTM. Bajaj has been gradually increasing its stake in KTM for past few years and recently it has added about 6.3% more to its KTM stake. Bajaj bought these shares from a key shareholder in an open market transaction though its subsidiary Bajaj Auto International Holdings ( BAIHBV) in Netherlands. During the launch of Bajaj Duke 200 in New Delhi, Mr. Rajiv Bajaj, MD Bajaj Auto clarified that they will gradually increase stake in KTM but they will not buy majority stake as they do not have intentions to be a majority stake holder in the company. Rajiv said that they want KTM to retain its identity and ownership to continue with its vision and strong product lineup. Also read – KTM India Strategy And Roadmap In India, before this latest increase in stake, Bajaj held around 40% stake in KTM. Bajaj Auto first bought stake in KTM back in 2007 which it kept increasing gradually. KTM bikes are quite popular in Europe and USA and besides slowdown in motorcycle sales in these regions, KTM has managed to keep a consistent growth there as well. KTM Duke 125 and KTM Duke 200 are two very popular products in these markets. KTM uses Bajaj facilities in India for making its bikes and it also exports the bikes form India to many export markets. In past few years, there has been good growth in both KTM and Bajaj, coming together of these two brands have added up their strengths for mutual benefits and growth. 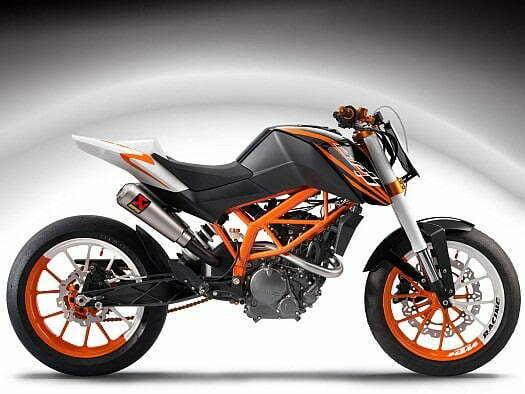 Bajaj intends to produce over 50% of the total KTM Motorcycle by year 2015 which is at present about 13.5%. We will keep you posted on the latest developments, do stay tuned to us by signing up for our free email newsletter and like our official Facebook Page.